He went to Batam last Friday for work. Well, I went there with M on Saturday to join him. It was a long weekend, as Monday is a public holiday 😀 We were staying in Harmoni Suites Hotel @ Nagoya Hill. It was not bad, within walking distance to the Nagoya Hill Mall. There’s KMart and 2 Teochew Porridge shops outside. Quite convenient, I would say. Reached batam at about 1230pm (Batam time), slight delay at the custom and off to the hotel. The cab fare was 50,000 rupiah from Batam Centre to the Hotel. We lazed in the hotel room till about 2plus, decided to go for massage. 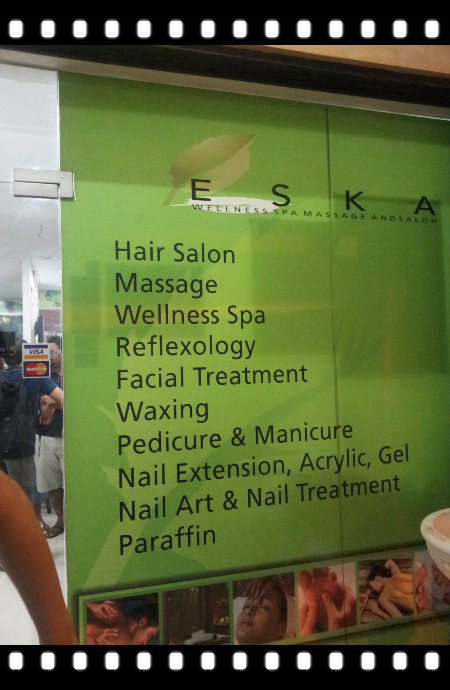 Checked the reviews, and decided to call Eska Wellness Spa Massage and Salon. It’s just opposite Nagoya Hill Mall’s A&W at the West Entrance. So after massage, we can have a walk there. We called them, and arranged for a pick up from our hotel. They said they will be here in 30mins. 45mins went by, we decided to call Eska again, we then know the driver was waiting at the wrong Harmoni. The hotel staff directed them to our hotel. Meanwhile, the lady on the other line requested to speak to one of us. M came back saying that the lady said the pickup will only be waived if we spent 800,000 rupiah or more. If not, they will charge 50,000 rupiah for that. Well, why didn’t she said so earlier on the phone when we called? Anyways, we are ok with the transport charges. The entire wait was almost an hour, we might have reached much earlier if we took a cab there. Reached there at about 4pm. Oh my, it was so crowded…lotsa people at the counter while Linda, the Assistant Manager,was explaining the services to different groups of people. They provided so many services, really from head to toe, inclusive of Hair Salon, Pedicure & Manicure, Massage, Scrub, Milk Bath, Waxing, etc. She gave us their services list to read first while attending to others. I opted for the 1.5hrs Reflexology/Foot Massage (132,000 rupiah, inclusive of service + additional holiday surcharge) since they wanted the 2hrs Body Massage. Finally, she got time to talk to us. Only then she told us that we gotta wait to 6pm because it’s fully booked now. Well, ok then, anyways, we just switched our itineraries around. So, settled upon her request of a deposit of 50,000 rupiah. We went to have our lunch at Nagoya Hill Mall, we hadn’t had anything since breakfast at the Harbour Front Terminal. 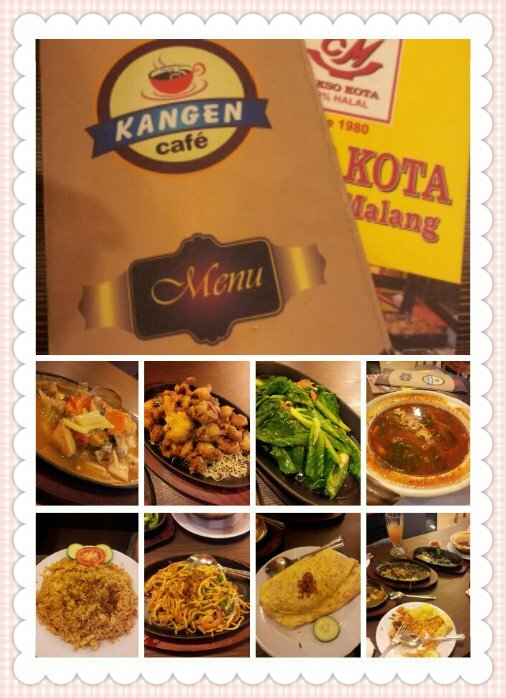 He brought us to Kangen Cafe, which he went with his colleague on Friday. It’s at Level 3 or 4 in the mall. Didn’t we plan to have a quick lunch and not too full before Massage? Well, we’ve ordered 4 dishes and fried rice/mee goreng each. Wahahaha… It was filling, and it only cost about S$20 (shall talk about the food in detail in the next entry here). Went for a short walk after that, and headed back to Eska. Finally, I heard him asking who’s doing foot massage. I quickly went to him and he brought me to level 3. I didn’t have to wait for long and I quite enjoy the 1.5hrs of leg massage. After 1.5hrs, I went down to level 2, expecting to wait for them. To my surprise, they were already sitting there waiting for me. I was thinking “Oh, how come so fast”. What’s shocking came next, he stormed off. Apparently, they were still waiting for their turn! OMG!!! I passed him my card and waited to talk to Linda. She saw the cards and said “ok, 3 pax”, and wanted to collect the balance of the charges. M told her that they didn’t get their massage after the LONG wait. She didn’t apologise and wanted to collect the 132,000 rupiah of the foot massage which I did. M told her that she had to give us a change of 18,000 rupiah, because we paid the deposit of 150,000 earlier and since they didn’t get their massage done, why should we pay for the deposit? And yet, we showed displeasure and definitely not happy about the incident, She still didn’t apologise. She gave us the change back and we just walked out of the shop. Why was it so difficult to apologise to your customers? Checked out at around 1plus on Sunday, Hari Raya as well. Went to Spa Secrets to try our luck, but not opened. Went for a walk in Nagoya Hill Mall again. Had A&W, but think the standard dropped. Not as nice as those we tried in the past. Oh, as we still have too much rupiah left, we decided to buy Indomie back 😀 We bought 2 boxes (48pkts in each box). Intended to bring 10pkts to office :p Looking at the watch, we’ve decided to board the 530pm ferry (oh, we purchased open ticket for the return trip as we not sure what time to go home). We went to Batam Centre (cab fare of 60,000 rupiah), bought the tickets and head back to Singapore. Reached at about 730pm (Singapore time). 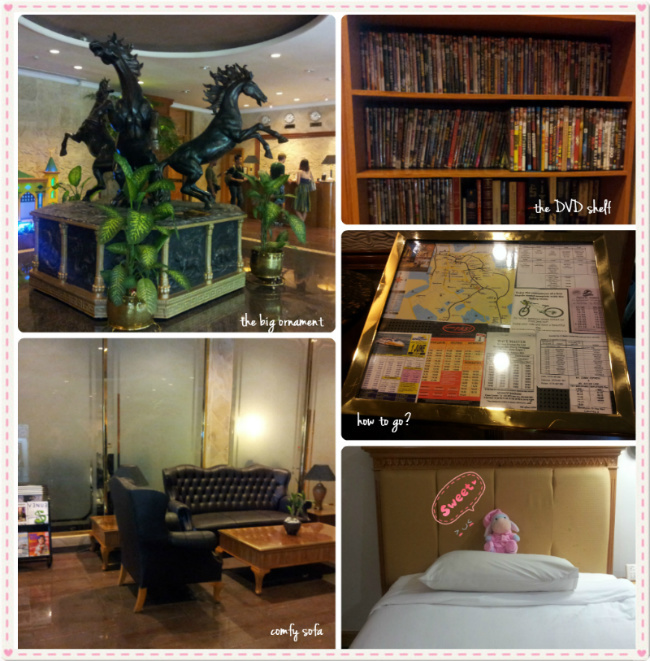 May i know does the hotel (harmoni suites hotel) collect any deposits from you? How much does the deposit cost? Yes, we did pay for the deposit but was returned upon checkout. Asked but my boyfriend forgot the amount. Maybe you can drop them an email to ask about it.